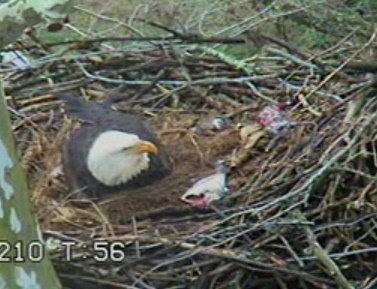 Two bald eagle chicks have hatched at Duke Farms in Hillsborough, NJ. They have put up a webcam so all can observe the chicks. A screen capture is below. The live web cam feed can be accessed from the Duke Farms web site or if all works well, clicking on the bottom image. PLEASE NOTE: Bald Eagles are extremely sensitive to human disturbance. At no time should anyone approach nesting eagles. People who want to observe or photograph eagles and who come too close may actually cause the birds to abandon a nest.